A German professor who claims to have developed “a self-consistent field theory which is used to derive at all known interactions of the potential vortex” will have at least two papers retracted, thanks to the scrutiny of a concerned economist. This article has been officially retracted from the Journal. However, Ulrich Berger, a Vienna University economist and president of the Austrian Society for Critical Thinking, who brought the matter to the attention of relevant journal editors, tells us that a proper notice will appear in an upcoming issue of the journal. The editor of the Journal of Cell Communication and Signaling also told Berger that a paper Meyl published there, “Task of the introns,cell communication explained by field physics,” would be retracted. Meyl submitted the same paper 5 days earlier to the journal DNA and Cell Biology, where it was accepted and published  online in Oct. 2011 and in print in volume 31 (4), 2012. He later submitted a shortened version of the same paper to the Proceedings of the Progress in Electromagnetics Research Symposium (PIERS) 2012 in Moscow, where it was published a third time  in fall 2012. He also submitted this paper to the WMSCI 2012 conference, where it was published  a fourth time in the proceedings in summer 2012. The “scientific” content of the paper is utter nonsense, at times reminiscent of an involuntary Sokal-hoax. The nonsense is so obvious that even a non-biologist like me can recognize it, but just to make sure, I have solicited the opinions of a molecular biologist, a biophysicist and a geneticist. They all agree that the paper contains crazy science-fiction at best. To give you a glimpse of this: According to this paper, magnetic “scalar waves” (an invention of Meyl unknown in temporary physics) emanate from the DNA of human cells and bring these cells in resonance with each other, their environment, and other human beings. This, according to Meyl, explains not only epigenetics, but also the workings of telepathy, telekinesis, and the human “aura”. Moreover, it reveals why love will never be measurable. DNA generates a longitudinal wave that propagates in the direction of the magnetic field vector. Computed frequencies from the structure of DNA agree with those of the predicted biophoton radiation. The optimization of efficiency by minimizing the conduction losses leads to the double-helix structure of DNA. The vortex model of the magnetic scalar wave not only covers many observed structures within the nucleus perfectly, but also explains the hyperboloid channels in the matrix when two cells communicate with each other. Potential vortexes are an essential component of a scalar waves, as discovered in 1990. The basic approach for an extended field theory was confirmed in 2009 with the discovery of magnetic monopoles. For the first time, this provides the opportunity to explain the physical basis of life not only from the biological discipline. Nature covers the whole spectrum of known scientific fields of research, and interdisciplinary understanding is required to explain its complex relationships. The characteristics of the potential vortex are significant. With its concentration effect, it provides for miniaturization down to a few nanometers, which allows enormously high information density in the nucleus. With this first introduction of the magnetic scalar wave, it becomes clear that such a wave is suitable to use genetic code chemically stored in the base pairs of the genes and electrically modulate them, so as to ‘‘piggyback’’ information from the cell nucleus to another cell. At the receiving end, the reverse process takes place and the transported information is converted back into a chemical structure. The necessary energy required to power the chemical process is provided by the magnetic scalar wave itself. In one case involving the Meyl papers, a reviewer suggested by the author requested just minor revisions, while another reviewer — not suggested by the author — called it “way out there” but said it could be right. The fact that scientists had recently discussed “bacterial communication by electromagnetic waves” gave the ideas some credence. Scientific misconduct and forgery with publishing is simply not acceptable and those who take advantage of the involuntary and unavoidable weaknesses of the publishing system, have no place in our scientific community. We’ve asked Meyl — who sells various equipment, including a 3,600-euro device that allows users to “construct an energy transmission line according to Tesla” — for comment and will update with anything we learn. 3. WMSCI 2012 Proceedings 113–117. The real problem with the paper is that it omitted the discussion of gyres. Probably the concept of gyres made no sense to the author. No, no, no — not “gyres”! That would make no sense whatsoever. You are probably referring to gyrocosmic fluctutuations, right? Incidentally, I’ll have a paper out about these in JNS (Journal of Spectacular Nonsense) next month. The real problem with the paper is that it omitted the discussion of gryphons. That’s some good refereeing right there. What is “temporary physics”? I think somebody meant “contemporary”. I was always under the impression that a Bachelors/Masters/PhD degree were all by solo effort-under supervision. That being the case I would have thought that the entire PhD thesis was a solo effort (of course the candidate would have had to learn various new skills in order to carry out the required experiments/field work etc). I am now informed that the supervisor CAN be a co-author if any part of the thesis is published. Is this true? ie: the supervisor can now be a collaborator in some part of the thesis. If this was allowed how would the university decide on the award of the degree? Can anyone please enlighten me a bit about this. In the sciences, various chapters of the thesis are likely to be already published as peer-reviewed primary articles. Rarely are these papers single-authored, because many people’s ideas and work can contribute to a single paper. The advisor often provides the foundation for the experiments, the ideas of where the research is going, and input into how the data are analyzed and presented in written form. Thus, the advisor is almost always a co-author of several chapters. I agree with the sentiment that this *can* mean that entire chapters of the thesis were actually written by the advisor, relegating the PhD candidate to a technician status. It thus becomes the duty of the committee memebrs to probe the knowledge and participation of the candidate. This DNA and Cell Biology, the self-proclaimed “trusted and respected source for the latest research in the field”, is yet another example of so many marginal and tangential publications, whose only purpose seems to be to charge publication and access fees for research nobody but its authors is interested to see published. 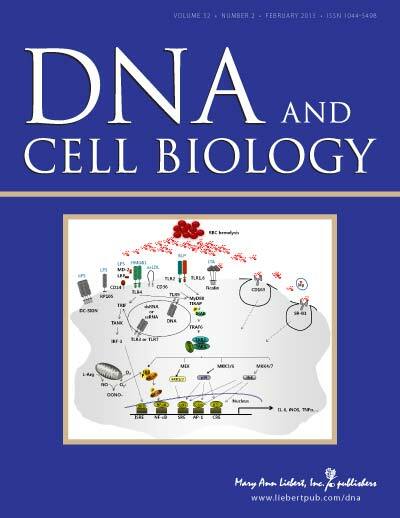 I guess working in – broadly speaking – nucleic acids enzymology I am “in the field”, and I read broadly, yet never in my life I needed to consult this journal. And while most of the stuff that appears there is innocous inconsequentia, apparently the reviewing process – or its substitute – at D&CB lets in such abominal intellectual excrement. I can’t see anything like this drivel being even sent out for review at NAR or JMB, your old school blue collar research workhorses. “This article has been removed from the website on February 1, 2013, because it has been found that its contents have been published in other journals [1, 2] and violate self-plagiarism and copyright infringement rules of PIERS Proceedings. Journal of Cell Communication and Signaling, Vol. 6, No. 1, 53-58, 2012.